Zoysia Farm Nurseries: The Classic Halloween Look! Nothing says Halloween like an oversized jack-o-lantern and black cat. 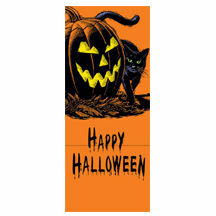 Traditional orange and black colors simply state Happy Halloween. Your trick-or-treaters and everyone else will know this house celebrates Halloween in a big way.